Backpacking clothing has some unique requirements that must be met to keep the Scouts comfortable and safe. Clothing needs to protect you from the elements of sun, wind, and rain. Clothing needs to function equally well in the cold and heat and everything in between. Clothing needs to breathe as the level of activity changes throughout the day. Clothing needs to dry in as little time as possible. Clothing needs to be as lightweight as functionally possible. For Scouts, clothing needs to be inexpensive. Technology has changed the face of clothing options from what they were 20 to 40 years ago when everything you wore was wool. Today there are ultralight fabrics that can keep you warm and dry and weigh a fraction of yesteryear’s wool options. These new fabrics at times are very expensive, so our recommendation will be aimed at keeping it simple, functional, and cheap. As the boys get older, they may pursue more expensive options, but for our new Scouts the following suggestions will keep them comfortable and safe while not breaking your wallet. One quick rule for clothing fabrics: NO COTTON! This includes sweat shirts, sweat pants, blue jeans, socks, boxers, briefs, t-shirts, etc. Cotton takes an extremely long time to dry, does not wick moisture away from the body but keeps it next to the skin, and when it is wet or damp from sweat it doesn’t provide your Scout with any warmth, thus endangering them just when they need the warmth. Base or Wicking Layer – in direct contact with the skin. Insulation Layer – provides warmth when needed. Outer Wear – provides protection from wind and/or rain. This layer is in direct contact with the skin and is designed to keep the skin dry by moving moisture from the skin out to the surface of the fabric. If perspiration is removed quickly from the skin’s surface, outer layers keep you warm more easily. 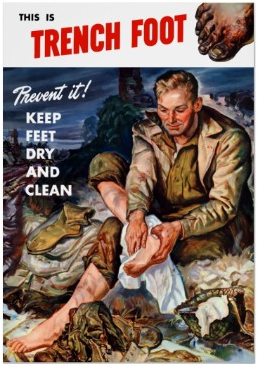 Conversely, if the layer of clothing next to your skin becomes saturated and dries slowly (read – cotton! ), your other clothes, however good, have a hard time keeping you warm. Scouts may find that wicking clothing is much more comfortable than cotton not only for backpacking, but also for everyday use. Most of the base or wicking layer clothes mentioned below can be purchased at sporting goods stores, discount web sites, or department stores. Scouts should have either short sleeve shirts for hiking temperatures over 50 °F or long sleeve shirts for hiking in temperatures under 50 °F. These shirts are usually styled like a t-shirt. They are made of different types of new fabrics that wick moisture away from the skin. Two of the most common wicking fabrics are Coolmax and Capilene, but there are many others. These shirts are very thin and lightweight. Scouts should usually pack two shirts, one for wearing during the day and one for sleeping in at night. Depending on the length of the excursion, Scouts may need to bring some additional clothing so that they can wash some clothing during the backpacking trip and let it dry. Class A’s are great utility shirts for backpacking…. they’re not just for dress, they serve a function with plenty of pockets. When hiking, even in colder weather, many Scouts prefer shorts because of the heat that their legs generate. Cotton boxers/briefs trap perspiration and don’t allow the skin to dry, which can lead to chaffing. A much better solution is to go to the running or the bathing suit department to purchase your hiking shorts. These shorts are made of materials that dry very quickly while having built-in liners of wicking fabrics that allow your skin to stay dry. By using these shorts, the boys do not need to bring boxers/briefs at all, which is a definite weight savings. Only one pair of shorts is usually required for hikes and remember the shorts double as a swimming/bathing suit. If your Scout decides to use boxers/briefs, we recommend are Patagonia’s Capilene SW Boxers, $29.00, or Capilene LW Briefs, $17.00. Other companies and stores do have wicking underwear, but you will have to search a bit harder for them. All new Scouts have lots of cotton socks at home. Guess what sock material causes the most blisters because it cannot transport water away from the skin? You’re learning, cotton. Guess what sock material takes 12 to 24 hours to dry if it gets wet? Right again, cotton. So what to do? Go to the running or outdoor store and purchase socks made out of wicking materials such as Coolmax or merino wool. With socks made out of these materials, you only have to wear a single layer instead of a liner and regular layer to prevent blisters. The socks may come in different thicknesses. Choose thin for hiking in the hot desert, and thicker for colder weather. Wool socks have been the staple material for hundreds of years for a reason. If nothing else 2-3 pairs of wool socks can last through a 14 day backpacking trip. Your main form of transportation is your feet. Take care of them! The sleepwear you choose will depend on if your son sleeps hot or cold, how warm the sleeping bag is, and what the outside temperature is. I sleep cold so I tend to sleep in a long sleeve wicking t-shirt, light weight long fleece pants, and warm socks, while my son, who sleeps warm, is in boxers only. One additional sleeping item is a thin wool or fleece watch cap or hat. Since a lot of your body heat is lost through your head, a cap will keep your whole body much warmer. This layer is basically designed to keep you warm, but it also has the task of dealing with the moisture brought up from the base or wicking layer. Far and away the most common fabric that is used is fleece. Technology has also developed some various fabrics that are a cross between an insulation layer and an outer layer that handle moisture exceedingly well while providing wind and mild rain protection. Two different situations are usually presented to backpackers that concern their insulation layer. The first is that when you are hiking hard, the requirements for the insulation layer is vastly different than the second situation when you are standing around camp just trying to stay warm, especially after sunset or in the early morning prior to sunrise. When hiking hard, your body is generating a lot of sweat. This moisture must be removed from your skin by a base or wicking layer and transported outward where it can evaporate without taking lots of body heat with it. If you were wearing a plastic bag that did not breath or allow moisture to pass through all your clothing, inner layers would soon be so full of moisture they would be completely soaked. Our goal is to allow this moisture to pass through and evaporate while maintaining your core warmth. While hiking, you really do not need to wear much in the way of insulation layers because your muscles are generating so much heat your body core doesn’t need to conserve heat; it needs to get rid of it. That is why you may see people hiking in the snow with t-shirts and shorts. However, when you stop hiking, within 5 minutes your core temperature will start dropping. This is when you will require some additional insulation and even more will be needed when stopped for prolonged periods. The requirements for the insulation layer change as your activities do. The easiest way to deal with this is to provide multiple layers. These layers can be different thicknesses and/or different materials. A thin fleece top will provide enough warmth while hiking in cold weather or when stopped for a short period in warmer weather. A heavier fleece vest/shirt may be needed when stopped for a prolonged period. A jacket (down or synthetic insulation) will be needed for camp wear after dark or in the early morning. Instead of packing multiple jackets of different thicknesses, try to wear multiple thinner layers. This means that at night or in the early morning you are wearing all the hiking clothes you brought with you. This is a great way to save weight, don’t pack any more clothing than can be worn at one time. For insulation while hiking, bring a light fleece (100 weight) or a nylon thinly insulated windbreaker to put over your shirt or to wear when you have a short stop. When you are done hiking for the day, immediately get out of your hiking clothes since they are damp and get into your dry sleep wear (warm socks, light weight fleece pants, wicking long sleeve t-shirt). You can then add a lightweight fleece top or windbreaker to this. As it gets colder, add a down vest, wool hat, fleece gloves, then eventually add your rain jacket and rain pants if you are still not warm enough. If you’re still cold, get into your sleeping bag with some or all of these clothes on. Your insulation clothing choices need to be lightweight while providing maximal warmth. Please remember the more pockets, hoods, or zippers, the heavier the garment will be. Weigh your choices on a scale prior to packing, it will change your opinion on what to bring. You will find that one pair of fleece pants will weigh twice what another does without providing additional warmth (thickness or loft equals warmth). 100 weight fleece (Polartec, Microfleece, Expedition weight underwear): these can be purchased for under $20 – or a whole lot more. These are always on sale at some web location. Do not pay full retail. Insulated windbreakers (water resistant/slight insulation): can be purchased for $60-$100 or for a few dollars at the thrift store. An example is the Marmot DriClime windshirt, which is lined with a very thin layer of tricot. Make sure the insulation does not contain cotton. 200-300 weight fleece (heavier than down or synthetic insulation but usually the cheapest choice). Down insulation (lightest, warmest, most expensive – usually): try google.com/froogle, type “down vests” and you will get a wide range of prices. Synthetic fiber insulation (weight and cost are in-between fleece and down). This layer is designed to protect you from wind, rain, and snow. This layer is sometimes called your shell garment. There are two main types of outerwear: ones that are windproof but not waterproof, and ones that are both windproof and waterproof. Every Scout needs an outer layer to block the wind. If the wind can blow through your insulation layers unobstructed, you can lose a lot of body heat. Another way to think about this is if you have a good windproof layer, you need less insulation – less weight to carry – to stay warm. This layer in its simplest and lightest form is a very light nylon jacket and pants without many pockets or other bells and whistles. They are sometimes referred to as windbreakers or wind shirts. Ross discount department stores, for example, carry many different windbreakers that are either lined or unlined that are very inexpensive. The unlined are lighter in weight, the lined are warmer, your choice. Just make sure there is no cotton in the lining. Wind blocking clothing will really be appreciated when hiking in a buggy area since it also helps block mosquitoes. Some manufacturers are modifying the wind blocking fabrics to make them water resistant. For a mild rain shower, a water resistant jacket is the only jacket that you will need to wear while hiking. The cheapest and lightest windproof and waterproof rainwear is a large plastic trash bag. That is one reason we want the Scouts to bring two or three emergency trash bags on each hike. A trash bag will keep rain out but also will hold moisture in so the Scout may become drenched from sweat. Many modern fabrics are waterproof and breathable and keep rain out, and also allow some moisture vapor from perspiration out. The most renowned of these fabrics is Gore-Tex. There are literally hundreds of these types of fabrics now. These fabrics tend to be very expensive and somewhat heavy. The place where Gore-Tex really shines is winter backpacking in the snow and ice. These jackets and pants really do a good job of keeping you dry but cost multiple hundreds of dollars. Because of the high costs, I do not recommend these jackets for new Scouts. Once they have been backpacking for a few years and have stopped growing, this may be an option. The Gore-Tex type jackets can usually be found on sale at numerous web sites. A less expensive option is a Frogg Toggs rain suit for $60. This rain suit weighs about 15-16 ounces and is waterproof and breathable but can tear easily if not treated carefully. The cheapest rainwear option for new Scouts is the Campmor extra large vinyl poncho for $5 and 14 ounces, which is hard to beat for cost and durability. A lighter option is the Campmor silnylon Ultralite Poncho/Shelter that costs $40 and weighs 7 ounces. Either one will work well while also continuing to fit the boy as he grows. The added advantage is that ponchos cover and protect the pack from the rain. Poncho fabric is wind blocking, but ponchos, by design, don’t completely block the wind. If you wear a windbreaker jacket and pants under the poncho, this will block the wind while the poncho blocks most of the rain. 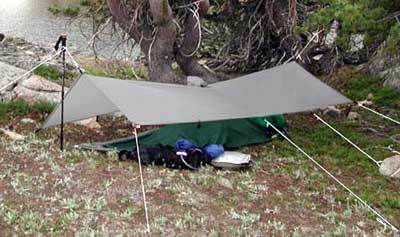 The poncho can also serve as a ground cloth and, with practice, an overhead shelter. All new Scouts can use the sneakers that you wear for everyday use for backpacking. Since Scouts are constantly growing out of shoes, do not purchase specific shoes for hiking, especially not leather hiking boots. Your current sneakers will do fine as long as they are not completely filled with holes and have some tread left on the bottoms, and are able to be tied tightly. When you look at new sneakers, consider purchasing running, or even better, trail-running shoes instead of items like “skate” shoes.